In Israel, we have a fold we call ‘qua-qua-de-la-oma” or for short, “qua-qua”. I believe in english it is called a ‘color changer’, but I’m not sure of that. 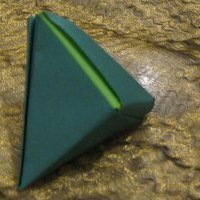 In any case, this fold yields a 3D shape similar to two connected tetrahedrons. (It is only similar because the shape is not completely symmetric). I couldn’t find a name for this shape, and since the same fold yields a qua-qua, I called it a qua-qua-egg. This fold is very useful as a makeshift ball to throw around the office. This entry was posted in Math, Origami and tagged ball, folding instructions, Origami. Bookmark the permalink.